Efficiency in engineering means managing your most precious resources: time and effort. Automated testing is essential and boundary-scan is a critical component; no other structural test system provides the same value. When down to the wire, your boundary-scan test system needs to be built both for ease-of-use and reliability; a robust and powerful mechanism to ensure that no matter the state of production, all boundary-scan tests can be quickly and faithfully executed to maintain forward momentum. ScanExpress Runner™ is a fully featured JTAG test executive; a modern software application that provides the capabilities and options necessary to ensure a smooth and complete testing process. With visual, one-touch execution of ScanExpress test sequences and interface support for all major test platforms, ScanExpress Runner stands proud as the reliable daily workhorse of the ScanExpress software family. The ScanExpress Runner™ test executive enables execution of IEEE-1149.1 & IEEE-1149.6 (JTAG) boundary-scan tests with an easy-to-use graphical user interface (GUI) and advanced test execution features. 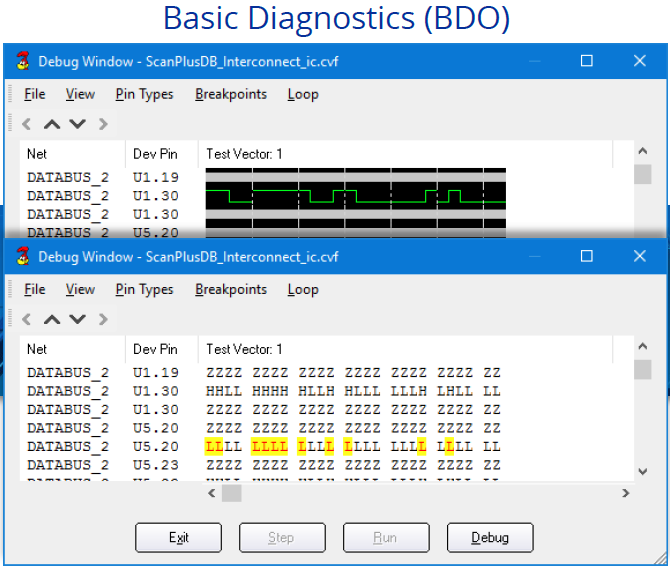 Runner comes standard with Basic Diagnostic (BDO) functionality and can be enhanced with the optional Advanced Diagnostics (ADO) module for detailed pin and net level diagnostics. 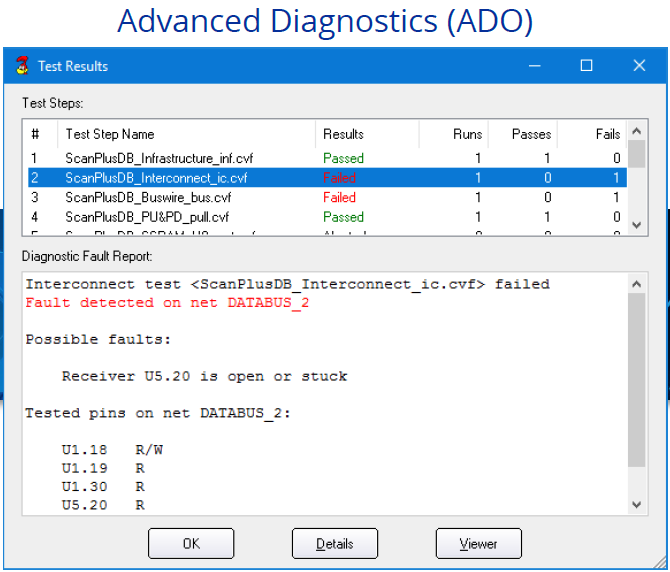 Advanced Diagnostics (ADO) module adds detailed descriptions of detected faults down to the pin and net level. 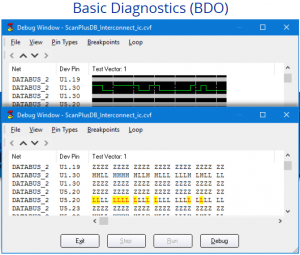 Basic Diagnostics (BDO) module displays complete Truth Table Diagnostic test results in pattern or waveform format. ScanExpress Runner can be utilized to run both boundary-scan structural test steps generated by ScanExpress TPG™ and functional tests created by ScanExpress JET™, enabling a holistic approach to JTAG-based non-intrusive test. Whether on the desktop, test bench, or in the field, a complete JTAG test strategy can be achieved with just a host PC, Corelis JTAG controller, and ScanExpress Runner execution software1. In addition to the intuitive operator interface, ScanExpress Runner includes a third party application interface consisting of DLLs, command-line functions, and LabVIEW virtual instrument drivers. ScanExpress Runner integrates easily and conveniently into off-the-shelf test executive solutions and custom, in-house software solutions alike. ScanExpress Runner supports execution of test step files created by Corelis’ own boundary-scan tools as well as test step formats created third party vector generators for JTAG testing and in-system-programming. ScanExpress TPG™ generated test step files for world-class boundary-scan testing. 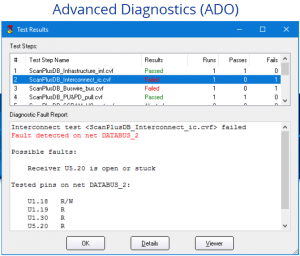 ScanExpress JET™ test step files for JTAG-based functional tests using embedded CPUs. ScanExpress Flash Generator™ files for Flash and EEPROM in-system programming. Standard vector files for FPGA, CPLD, and microcontroller programming. Script-based test steps for utility functions and interfacing with third party command-line applications. Use boundary-scan to test, debug, and verify prototype hardware, then reuse the same tests for full-scale production. The graphical user interface is both straightforward and powerful, enabling execution of complete tests with the click of a button. Re-use the same tests from development and production to reduce troubleshooting and repair times. If you would like assistance with implementing JTAG testing in your design, or you are simply short of resources, our talented and experienced engineering staff can help you with all your JTAG needs.